The mango (Mangifera Indica) is a tropical fruit native to Southern Asia. There are many varieties of mangoes that come in a wide range of colors and shapes, but the inner flesh is mostly golden yellow regardless of the color of the skin. Depending on the nation, mangoes can also be called “mangot”, “mangga” or even “the king of fruits”. The mango has earned this nickname for its impressive number of vitamins, minerals, and antioxidants. As a fibrous fruit, mangoes enhance the digestive process and strengthen the stomach by cleansing the digestive tract and colon, as well as assisting in the breakdown of of proteins. The esters, terpenes, and aldehydes also play a role in improving the function of the digestive system and enhance appetite. Moreover, mangoes have a high water content and can encourage urination, ridding the body of excess acidity. Mangoes are good in detoxifying and ridding the body of harmful free radicals because of their high concentration of antioxidants; some of these antioxidants even have antibiotic qualities. Pregnant women are recommended to eat more mangoes due to the great amounts of iron present in the fruit. Iron is a mineral essential to pregnant women, as well as those suffering from anemia. In addition to iron, mangoes also contain vitamins A, C, and B6, which are vitamins that pregnant women need in abundance. Vitamin A is important for both the mother and child, since this nutrient can prevent vision problems in newborns and fight off infection. Mangoes contain plenty of potassium and are effective in maintaining an individual’s sodium levels; this means that these fruits regulate fluid levels and can prevent heat stroke. Raw mangoes are also known to quench thirst and remove heat, energizing and refreshing the body. Sensitized individuals should be careful with raw, unripe mangoes. At this stage, the mangoes contain anacardic acid, which can bring about a range of allergic reactions. In the most severe cases, mouth ulcerations, diarrhea, and vomiting can occur. 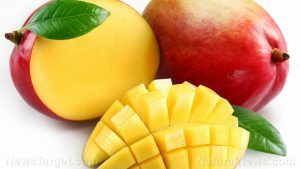 Naturally rich and sweet, mangoes can be eaten alone without any additions or seasonings, and are best enjoyed chilled. Mangoes are also suitable for juices and shakes; mango lassi, a popular Indian drink, is just one refreshing way to take in mangoes ,with an extra helping of yogurt and ground cardamom. Green, unripe mangoes are not as sweet as their yellow counterparts, but they can be prepared into jams and chutneys. How Mango Leaves Can Treat Diabetes? Mangoes help with the digestive process and strengthens the stomach. The fruit is also a great detoxifying agent. Many health experts encourage pregnant women to increase their intake of mangoes due to their impressive iron content. Mangoes have average antibiotic and antioxidant properties. They quench thirst, relieve vomiting, and promote urination.